Just another day in a life of a veritable vagrant, this morning saw me back at the airport, sitting at the California Pizza kitchen -the least of all evils- chowing on a salad. Yes, I am off again. This time a little farther afield, all the way to Thailand. It has been two years since the last time, overdue really. I am on assignment, for a rather grand magazine even. I'm not just going there for the assignment though, there are family to see and friends to play with and yummy things to eat and new old dishes to learn. It should be fun –the usual family entanglement notwithstanding. I'm planning quite a roller coaster ride, from fancy western dégustation menus, to rarefied Thai meals, on the table, the kitchen floor, the street and everywhere in between. You are very welcome to come with me. Some of those juicy details, naturally, you'd have to wait to read about in said magazine, but there will be plenty others fun things to go around. It's not like they'd let me fill up an entire issue's worth of materials. Or would they? Perhaps I should have asked? But before we get to Thailand, I promised you some fun stuff from my trip to Mexico last week. We were in Baja California, our second time in less than six months. David goes to surf, I go to lie around in the sun. In the summer we were over on the Sea of Cortez side, staying in San Jose del Cabo –the quieter, more genteel neighbor of Cabo San Lucas. 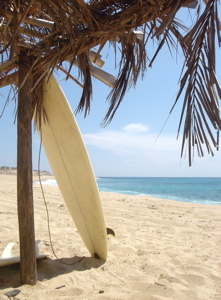 In the winter we followed the wind and the surf to the other side, staying over in Todos Santos. We spent five wonderful days in lovely Todos Santos. I did absolutely nothing, mostly sun bathing on the beach while David surfed. We stayed at a great little place owned by an Italian guy called Paolo, a friend of our friend Joe of Dirty Girl farm. I think we may have just found the best carnitas on earth. We also had some great ceviche, and even a seriously delicious paella valenciana made by Paolo, who's an ex Italian cook married to a Spanish woman from Burgos. So, at his house we had Illy coffee with the spanish cookie Rosquilla. How fun! For the paella Paolo and I went to Punta Lobos to buy fish right from the fisherman's boat, fighting off pelicans as we picked and chose our fish. This trip is worth quite a few posts. Check back tomorrow to see where that best carnitas on earth could be found! As any self respecting foodie who missed her flight at SFO yesterday, I knew just what to do. Hong Kong Flower Lounge. That's what. So that's what we ended up doing. After a midnight rush back to Santa Cruz from my place in the city to fecth my passport, we found ourselves yesterday morning at SFO two hours after we were supposed to because of a bit of confusion over the flight time change. No more flights to Mexico that day, we were to wait until the next day, this morning, to go there. What to do, well, instead of going 101 North up to the city, we went South for about a mile, took the Milbrae exit and less than a mile away at 51 Milbrae Ave is one of the best dim sum houses in the SF Bay Area. Then for dinner back in the city, we had a simple but wonderful pizza at Pizzetta 211. Three pizzas and a salad and an apple/ginger cake later, we got home, full and ready for another try at SFO. Keep your fingers crossed for us? And while you are at it, perhaps you'll drop by the Accidental Hedonist and vote for Chez Pim's Truffle Don post, which has been nominated for the Best Post: Reader's Choice on this year's Food Blog Award. Thank you thank you thank you. ....off to Mexico. Back Tuesday. Will try to blog from there a bit. Ciao. Forgive me friends, my brain was far too clouded by coupes of fizzy champagne new years eve that I forgot to thank the food blogging elves who kindly showed up at my place last week to help me process the raffle. Thanks to Fatemeh, Heidi, Elise, Amy, Faith, Shuna, and Brett with his sweetheart in tow, we managed the huge task of compiling the donor's names, making raffle tickets, and sort them into appropriate pots for the prize drawing. It was non-trivial, let me just tell you that. I don't even want to think how long it would have taken me had I done it alone! Thanks so much you all. You rock. And, yes, Elise, next year we are going to be looking around for some non-manual solutions for this task. I am so very happy to begin yet another year on Chez Pim with such a wonderful announcement. With the help of all the participating food bloggers who put up an enticing, dizzying array of prizes and the many, many generous donors, we are closing our Menu for Hope II campaign with $17,101.32 going to UNICEF to help support the victims of the Kashmir earthquake. Congratulations to all the winners, and thank you so very much to everyone for your help. Our Menu for Hope II is such a smashing success because of all of you. Thank you.